After sunset on a hot July night, the Shanghai Trash Runners moved quickly through a park along the Suzhou River, garbage bags and plastic tongs in hand. They scanned the sidewalk for cigarette butts, bottles, food containers, or any other litter that needed to be plucked from the ground and properly deposited into their bags. 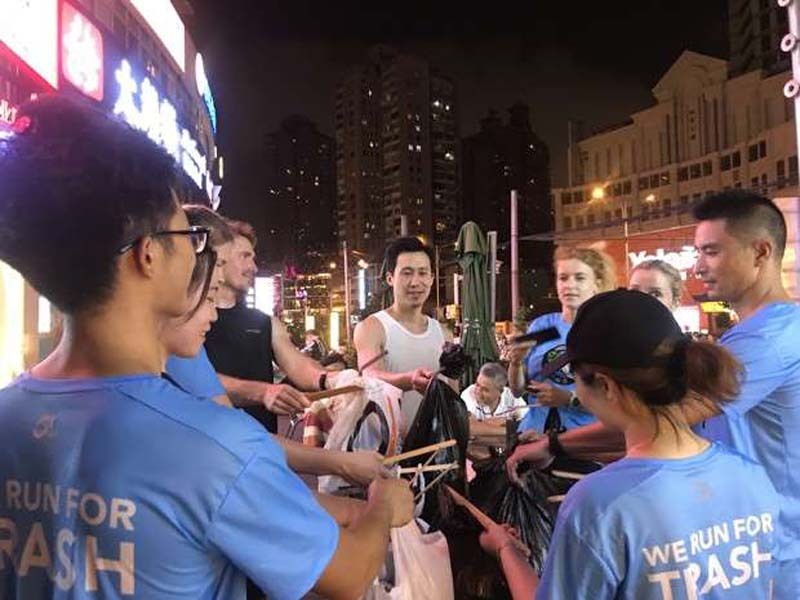 Zig-zagging through crowds of people out for evening strolls, through middle-aged dancers moving in sync to patriotic music, the Trash Runners left Shanghai a little cleaner in their wake. Like other Chinese cities, Shanghai is struggling to cope with the increase in waste that has resulted from surging economic development. In 2016, tons of garbage choked a major reservoir; the year before, three deer at the city zoo died from eating plastic. The city has relied on a network of informal recyclers to stem the tide, and recently introduced smart bins on city streets. [post_ads]Though it was a relatively small group that night (about 10 people), the Trash Runners have been growing steadily since their start just four months ago, part of a global movement to pick up litter while you exercise, also known as “plogging.” Some of the Trash Runners’ events have drawn more than 50 people, and their group on WeChat (the Chinese messaging app) has grown to more than 500 participants. Within its ranks are ultra-marathoners as well as folks for whom trash running is their only running. Everyone I spoke to said the real appeal of trash running was not the exercise, but the sense of connection and community—no small thing in a city of over 24 million. The Trash Runners left the park and ran into a business and residential area of Putuo District. They elicited a number of befuddled looks from passersby, although thumbs-ups were also common reactions. At one intersection Tan Yinghuai, whose nickname is Simba and who has been a Trash Runner since the beginning, caught back up to the group and said he’d stopped to give their WeChat information to a woman who wanted to join. Another runner said she’d just done the same thing. The group, which is about half Chinese nationals and half foreigners, runs one night a week at a central location in the city, and gathers each month for a more ambitious weekend excursion outside of town. Due to Shanghai’s chronic air pollution, it curtails runs when the Air Quality Index gets too high (150 or higher). Yinan Shen, another regular and a Shanghai native, said that running in general and triathlons in particular seem to be taking off in China. Thanks in part to government subsidization, marathons and trail runs are being held all over the country, even in relatively isolated rural areas. Running groups, too, are growing in number in Shanghai. But this is the only one that picks up trash. For the first trash run, in March, Kate and co-founder Celina Eisenring, along with eight others who responded to a notice on WeChat, went to run and pick up trash at Dishui Lake, about two hours south of the city. They planned a 20-kilometer (about 12-mile) route, which was too long, in hindsight. It was through Simba that Kerry Ding heard of the group, and she joined not long after, arriving at her first Trash Run straight from work and still wearing heels. The group snapped their customary selfie with the collected trash, then headed for a nearby bar to chat and play games. They’d run a little more than 5 kilometers (3 miles plus) in about 90 minutes—not bad, considering all the stops.